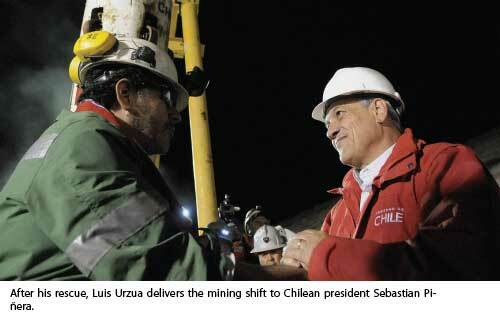 Surveyor Luis Urzua shares his experiences from the Copiapo mine in Chile. Over the last couple of years, the practice of mining has only occasionally been brought to the forefront of news broadcasts. When it happens, it never seems to be for the best of reasons; environmental complaints, long-term health problems of miners, and safety issues are typically the focus of mining stories. Recently the buzz has centered on safety issues. We have seen cave-ins in West Virginia, China, New Zealand, and Chile. In the majority of cases, the stories of the trapped miners end in tragedy. For every feel-good story like the rescue of the Chilean miners, it seems like there are three stories like the December tragedy in New Zealand’s Pike River mine where 29 miners died after a series of underground explosions followed a cave-in. Still, when the miracle of miners coming out of a collapsed mine occurs, it’s worth revisiting. Professional Surveyor Magazine recently had the opportunity to do just that with shift supervisor and surveyor Luis Urzua of the San Jose copper/gold mine in Copiapo, Chile. Urzua was the surveyor thrust into a leadership roll after the August 5, 2010 cave-in that stranded him and 32 others underground. The 33 mine employees survived a record 69 days in part due to the efforts of Urzua, who worked hard from 700 meters underground to aid rescue efforts on the surface. Since emerging from the mine on October 13, Urzua has experienced a level of celebrity: meeting with heads of state and receiving coverage with his fellow miners on CNN Heroes. For us Urzua explained how he became a surveyor and found himself in a position to lead 32 men out of the San Jose Mine. First, our congratulations on successfully providing the leadership necessary to complete this rescue! Would you give us a brief description of your work as a surveyor in Chile? I specialized in the inner part of the mine: performing determination of levels, polygonal closings, cracks, and connections between levels and pipes. The first mine in which I worked was for the Agustina Mining Company; there I learned to work as a surveyor thanks to a boss who liked to teach. Then I learned surveying while working in the field. Later I moved to another mining property named Las Pintadas in Copiapó, starting in the area of surface topography before finally moving to work inside the mine. PSM	When did you become a surveyor? What was your education and training? LU In 1990 I studied topography at Bernardo O’Higgins Professional Technical Institute in Copiapó. By that time, I already had knowledge of practical surveying and knew the work, but I needed the title of surveyor to work effectively in the mines. PSM How did you transition from surveying into managing the entire mining operation? LU I spent 12 years working as a surveyor for the Punta del Cobre Mining Company, and after a few years in this job I had the chance to advance to shift manager position. Because of my knowledge of surveying I could train people in the progress of the mining work. With mining, the surveyor marks the points and areas for further [drilling], and the shift manager has to do the work in the way he considers appropriate. Sometimes there are many differences between the product delivered by the surveyor and what the shift manager delivers. PSM What was your role as shift foreman and crew chief for this project? LU The shift manager controls the daily progress of the mine. [That person] must control and perform the topographical survey following the established indications. You have to draw the slopes and curves of the roads. In the mining industry, the opinion of the surveyors is not highly valued for the engineering affairs of the mine, but it is one of the most important elements at work. If the topography is poorly made, all the engineering is wrong. You should also control the production, monitoring progress, and drilling of production shots. This work is related to topography, and the shift manager is responsible for implementing [the mining plan based on] what the topography says. PSM Everyone seems to agree that it was your leadership skills among the 33 trapped miners—helping to organize the limited underground resources and keep everyone positive about the rescue—that resulted in the successful conclusion. What is the secret to your leadership role, and did you develop these skills as a crew chief and shift foreman? LU	The shift manager is responsible for doing the best job possible based on the instructions of the engineering team. Leadership is bolstered with courses, lectures, and meetings, with the leaders working to develop a useful complement to all parties. This produces more experience in the mine. Leadership grows with experience, but it is important to always speak the truth. In topography as well you can never lie, and if you want to be considered a good surveyor, you must not lie. In the specific case of the 33 miners, the first thing I did was talk to the group. We were 33 people with different characters and knowledge, but I told them that only by working with the truth would we find success. After that statement, the shift manager became just another one of those 33, although he had more experience and control. PSM How did you survey the collapsed tunnels, and what equipment did you have at your disposal? LU	First we looked for the topographic marks and measured with tapes. We had no instruments. The data [we collected] was sent to the drill in the first probe to the surface so they could locate [where to drill]. But the first probing was done only by God, who led the probes to where we were. PSM	Because you have a better understanding than almost anyone else of the tunnels and the challenge that your rescuers had, did you ever fear that you might not be rescued? LU	Before the first drilling was done we were afraid that they could not rescue us. We could sleep only when we heard the drills running. When the drills became silent, around day 15, we became depressed and did not sleep. I lost over 30 pounds (14 kg). But when they opened the first hole and we had communication with the surface and food and clothes, things changed. After those initial communications we were told they would drill to our rescue. PSM	While trapped underground, one of your colleagues trained for running a marathon and went on to complete the New York City marathon a few weeks after being rescued. What did you do in addition to manage things and plan your escape? LU	What I wanted was to oversee the issue of drilling. I also had to control the oil expenditure of the vehicles, and, after the drilling, I was in charge of the communications with the surface; I was one of the few who communicated with the surface. (I also made a set of dominoes to keep us entertained.) Once we established communication with the surface, the day was pretty busy offering speeches on safety, health, food, etc. In the 19 days without food we were declining slowly. Hearing the drill was the best music. When after 15 days we did not hear the drilling we thought we had been abandoned. The little food we had was divided into 33 equal portions. Rationing went slowly. In the beginning we ate a spoonful of tuna and some milk every 24 hours. Later we extended the period to every 48 hours for a spoonful of tuna. We never thought that the rescue would take 19 days. PSM	Is there anything you can tell your fellow surveyors about something you learned as the result of your experience in this accident that perhaps they also can learn? LU	The most important thing is that mine plans are properly created and updated. [The plans] must be accurate. This interview was conducted by Carlos Escudero, general manager of GEOCOM in Chile. It was translated from the Spanish by Marisol Rodríguez Rivera, GISP, CMS, PPL, editor of PSM en Español.